Bored with picking foil out of half-melted Easter eggs at this time of year? Yearning for adventure? Why not pack your bags and go on an Easter holiday of a lifetime to Easter Island… not a chocolate egg in sight – promise! This is the educational bit! Easter Island, also known as Rapa Nui by the natives, or Isla de Pascua by Chilean settlers, or Te Pito o Te Henua, meaning Navel of the World by Polynesian settlers, is about 2,300 miles off the coast of Chile. The name Easter Island was coined after Jacob Roggeveen, the first European to land here set foot on it on Easter Sunday in 1722. The history of the island is full of mystery, and there are many theories about how the population of 12,000 dropped to just 111, and of course about how and why the Moai appeared! The reason for the disappearance of the island’s 16 million trees and diverse wildlife is less of a mystery, a culture of slash and burn farming was to blame. Rano Raraku – The birthplace of the Moai! A quarry in a volcanic crater that also has a beautiful lake. It is thought that this is where the statues would have been sculpted, and there are many here in an unfinished state – one measuring a whopping 21 metres! 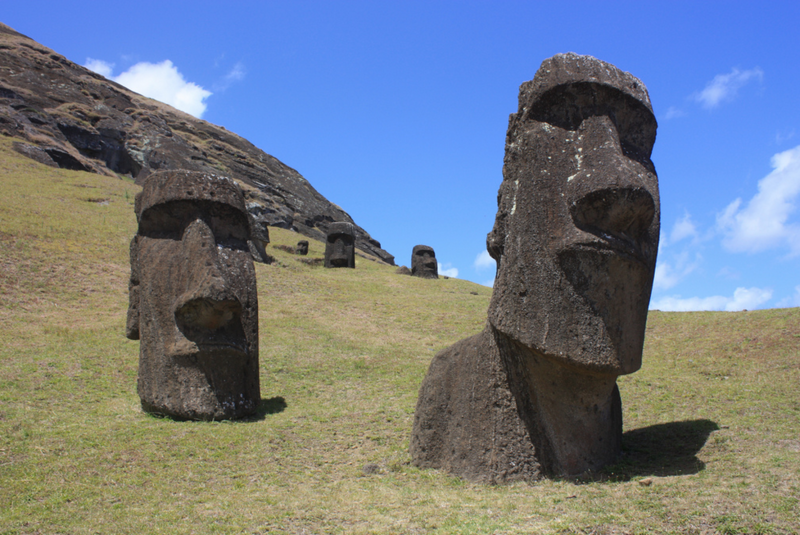 Ahu Tahai – At this beach location you can see the reconstructed Moai – the stone statues originally had eyes made of coral and obsidian. Ahu Tongariki – Go at dusk or dawn to see 15 Moai at their most magnificent – you’ll soon see why this is the most photographed spot on the island! Ahu Akivi – This is thought to be an observatory! Unlike the other statues on the island, the seven Moai here face out to sea. Anakena – 3 Moai, which are more or less complete, can be found on the dunes at this coastal location. Rano Kau – An extinct volcano, well worth the climb to the top. Orongo – A ceremonial village where the Birdman Cult is said to have replaced the Moai tradition. Ahu Huri A Urenga – A unique Moai that is not only situated inland (they are usually on the coast), but also because it has four hands instead of the usual two. Hanga Roa – The capital of the island, and home to Sebastian Englert Anthropological Museum where you can see some amazing artifacts relating to the island’s mysterious past. You’ll also find hotels, eateries, bars and cafes in the town – but be warned, things here are pricy because of the extremely remote location! As far as outdoor pursuits go – Cycling is a great way to discover all the above at your leisure, horse riding is also popular here, and the crystal clear waters is perfect for scuba diving! Surfing, sailing and kayaking is also available. FACT! In 2012, over 86,000 people visited the island! Make sure you get insurance for the outdoor pursuits mentioned above. Our Wintersports Insurance provides comprehensive cover for all sorts of adrenaline-fuelled activities. Get a free instant quote online or call us on 01892 833338. Find Out More! Visit EasterIslandTourism.Com for info about hotels, restaurants, package holidays, car rental, sports, and of course the best excursions! This entry was posted in Fun, Travel Advice on April 3, 2015 by worldwideinsure.